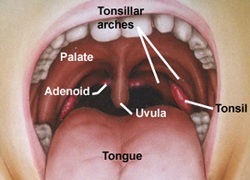 Tonsil ; sub-epithelial lymphoid tissue in the oropharyngeal part of our throat. Two in number. Ovoid mass in lateral wall of oropharynx between anterior & posterior pillars. Actual size bigger than it appears as it extends upward to soft palate, downwards to base of tongue & anteriorly into palatoglossal arch. It has two surfaces (medial & lateral) and two poles (upper & lower). Development of body immunity & antibody (early life). Protection of lower respiratory tract by guarding the entry to air passage. Formation of lymphocytes & plasma cells. Monitoring action – infective bacteria in incoming air & food, warns the body accordingly. Commonest cause is by virus such as Herpes Simplex virus(HSV ), adenovirus, Epstein-Bar virus(EBV ), Cytomegalovirus (CMV), measles virus. Bacteria cause 15-30% of infection. The commonest is Group A Beta-Hemolytic Streptococcus (GABHS ). Others are streptococcus pneumoniae, staphylococci and H. Influenza. 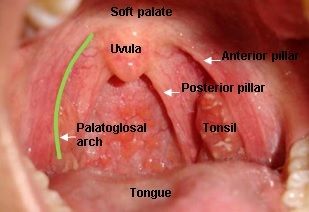 Acute catarrhal or superficial tonsillitis- part of generalised pharyngitis & seen in viral infection. Acute follicular tonsillitis- infection spreads into crypt which is filled with purulent material (yellowish spots). Acute parenchymatous tonsillitis- tonsils substance affected. Acute membranous tonsillitis- further stage of acute follicular, exudation from crypts coalesces to form a membrane on surface of tonsil. Difficulty in swallowing – refusal to eat. High grade fever – 38 °C – 40 °C, chills & rigors. Fetid breath & coated tongue. Hyperemia/redness of pillars, soft palate, uvula. 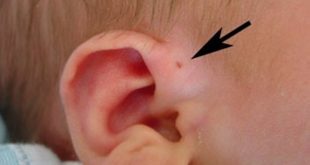 Tonsils – red, swollen with purulent material at opening crypt (acute.follicular) or whitish membrane on medial surface (acute membranous). Tonsils enlarged & congested, almost meet in midline with oedema of uvula & soft palate (acute parenchymatous). Jugulodigastric lymph node enlarged & tender. Antibiotics- only reserved for secondary bacterial pharyngitis. Considered if bacteriology is suspected ie presence of tonsillar exudates, fever, leukocytosis, contacts who are ill or contact with a person with GABHS infection. Chronic tonsillitis with recurrent acute attacks due to incomplete resolution of acute infection. Chronic infection persists in lymphoid follicles as microabscesses. Cervical abscessdue to suppuration of jugulodigastric lymph node. 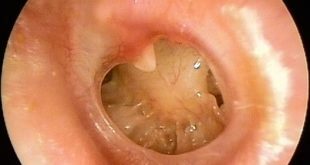 Acute otitis mediamay coincide with recurrent tonsillitis. Rheumatic fever due to tonsillitis with GABHS. Subacute Bacterial Endocarditis (SBE) in patients with valvular heart disease. Strept viridans. Recurrent attack – ?4 severe attacks per year associated with high grade fever, tonsillar exudate & cervical lymphadenitis. Upper airway obstruction – interfere with respiration, deglutition & speech. Upper airway obstruction can lead to sleep apnoea syndrome & coronary pulmonale. Peritonsillar abscess – 4-6 wks after it has been treated. Suspicious of malignancy – unilateral enlarged tonsil can be lymphoma (children) & Epidermoid Carcinoma (adult). Diphtheria carriers – not responding to antibiotics. Rheumatic fever & nephrotic syndrome. – where antistreptococcal prophylaxis cannot be maintained. Halitosis – due to pus in the tonsils. Palatopharyngoplasty – sleep apneoa syndrome. Glossopharyngeal neurectomy – IX nerve is severed in tonsil bed. Recent URTI – prone to bleed. Overt or submucous cleft palate. Bleeding disorders – leukaemia, purpura, aplastic anaemia, haemophilia. Uncontrolled systemic disease. – Diabetes Mellitus, Hypertension, cardiac disease or Bronchial Asthma. Tonsillitis is an inflammation of the tonsils most commonly caused by viral or bacterial infection. Commonest symptoms of tonsillitis include sore throat and fever. While viral tonsillitis resolve on its own, tonsillitis caused by bacteria is treatable with antibiotics. The operation to remove the tonsils or tonsillectomy is only reserved for certain reasons which will be discussed between the surgeon and the patient when it is indicated.